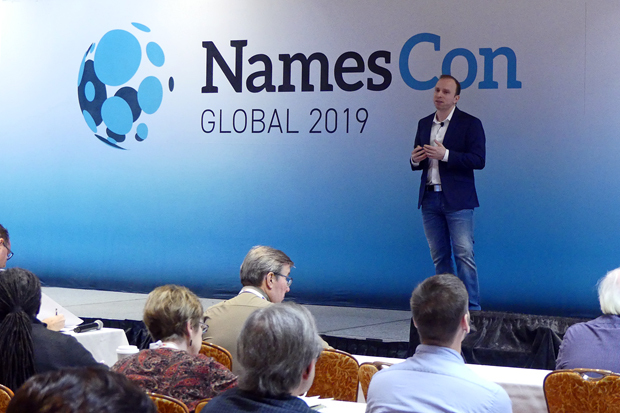 The 2019 NamesCon Global conference got underway Sunday morning (January 27) in Las Vegas. Domain investors, developers and service providers from around the world have converged at the Tropicana Hotel for the 6th annual event. All six shows have been held at the Trop but on Sunday it was announced that the conference will move to Austin, Texas next year with the dates and venue still to be determined. Below: At the same time on the Registry Office Breakout Stage Alex Melen (SmartSites.com) discussed The 3 B’s of Developing Domains: Buy, Build, Benefit.